When contemplating what to pair with, say, a Spanish wine, one way to narrow down is to look at food that comes from the same region as the wine. There’s often a synergy, for hopefully obvious reasons. By the same token, if you’re deciding what to pop open in cloying, hot summer weather, one thing to consider is wine that thrives in places where the heat cranks up. I give you Assyrtiko, a gold-skinned, large-cluster beauty native to Santorini, Greece. Its turn-ons include bone-dry volcanic soil, stiff ocean breezes, and hot days. Though it is planted in a few places outside of Santorini it is really a local character (unlike, for example, Chardonnay, which is planted everywhere you can think of and quickly learns to speak the local language), as the particular ash-rich soil imparts a very unique minerality. 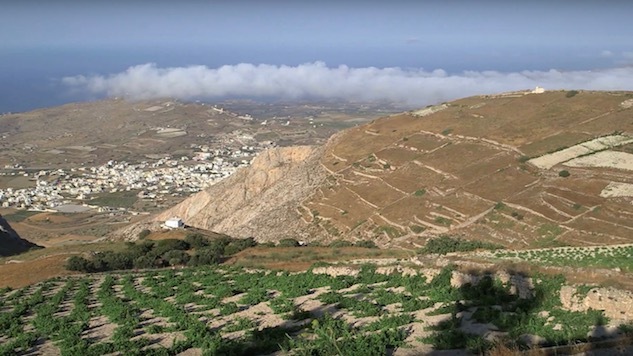 On the Greek mainland, where it’s a little less mineral-forward, and some other regions are experimenting with it, but if there is a truly Greek wine, it’s probably this one. Other than its intriguing minerality, its other hallmark is prominent acidity even when picked on the ripe side, which makes it a brisk, palate-cleansing friend on a sultry day. And despite its tendency to have a small range, it’s actually the Greek white you’ll find most easily in American shops, so lucky us. It comes from the heart of Dionysus-worshipping Mount Pangeon, and it’s organic. What’s not to love? One of Northern Greece’s only 100% Assyrtiko wines, this beauty from the southern slopes of Mt. Pangeon grows in richer soils that result in a lean, elegant wine filled with hints of almond and citrus. Like a lot of Assyrtikos, this wine wants to hang out with seafood. It also likes things that are salty. Marcona almonds. Feta or goat cheese. Play around. Bright golden yellow, lip-prickling acidity, and a pronounced saline character (think ocean breeze in a bottle). Aromatics are lush and pronounced, leaning toward jasmine and other white florals with a hint of lime leaf. A mix of tropical fruits (pineapple, maybe) on the palate but the dominant notes are citrus (lime and lemon), classical proportions and structure, and that certain volcanic je ne sais quois that typifies Santorini wines. You should probably not be surprised that this wine’s best friends include oily seafood and anything dressed in olive oil, as well as salty, lower-acid cheeses like feta. This Assyrtiko is also a Santorini classicist, though it has its own personality too. It manages to be both oaky and steely, and demonstrates a kind of strict structure that almost makes you imagine is a sort of echo-effect of grapes that have to stand their ground against high winds. Crisp yet deep, with mineral character more “earthy” than “stony” or “ashy.” Your new friend if you are a person who eats pork. Also, a griller’s companion, as it’ll relate to anything smoky (eggplant comes to mind; if you think you don’t like that stuff make sure you’ve tried it charred on a grill before ruling it out). A slight variant on pure Assyrtiko, from Ilia, Greece. The addition of Robola grapes changes the flavor profile a bit, but Assyrtiko is a pretty feisty varietal and makes its presence known. Ultra-dry with the signature acid-and-earth profile of most Assyrtikos, this wine also contains some less-typical and more tropical notes (it’s one of those bait-and-switch wines with a nose that will make you expect sweetness but it’s super-lean on the palate). Star anise pops up. And jasmine. And I think gardenia. There’s a certain fruitiness (citrus, pineapple and Asian pear) but it’s got a very restrained palate. A seafood wine for sure, but probably wide-ranging in its affinities. A mainland Assyrtiko with a modest addition of Sauvignon Blanc, Thema’s not quite as austere in its minerality as its cousins on Santorini. It’s richly aromatic, with a fuller body and some of the hallmark grassiness (more herby than grassy in this case, actually; there’s a slight note of fenel fronds) of the Sauvignon Blanc, though really, nothing stops Assyrtiko from being stony and acidic. Nonetheless you’ll get “soft” aromatics here too, including vanilla and bananas, and definitely a healthy ration of lemon zest. I find this wine to be magnificently balanced and thoroughly unpretentious-always a winning combination.